The Nav.it Podcast | Listen Free on Castbox. Join co-hosts Erin Papworth (CEO & Founder of Nav.it) and Lisette Austin (a.k.a travel hacker Jet Set Lisette) as they talk about freelancing as way to nav.it financially and in regards to lifestyle and career development. They both share their own freelance journeys and offer tips and insights into making the leap into a starting a small business.What You'll LearnWhy Erin decided to start a business and start freelancingSome of the challenges that can come with freelancing (real talk)How Erin navigated setting up an LLC, and why it may not be as intimidating as it seemsWhat freelancing has looked like for Lisette as wellThe importance of having a good accountant and knowledgable professionals on your sideWhy it's also important to ask questions, talk about the issues and educate yourselfThe importance of advocating for yourself - especially in regards to negotiating and setting your contract rateHow starting a business has changed Erin's life and perspective - why it's worth itReal TalkThis week's real talk story from the Nav.it app community is about Seville, Spain!If you want to have your story featured on a future episode, download the Nav.it app and leave your post in the Community section. We'd love to hear from you! If you are enjoying the Nav.it podcast. please take a moment to rate, review and subscribe – we would appreciate it as it really helps us grow the show. Other comments, suggestions or other feedback? Find us on Facebook, Instagram and Twitter at @letsnavit. Join Erin and I as we have a fantastic conversation with Whitney Hansen, host of the Money Nerds Podcast. She's also a money coach, adjunct professor and Facebook Small Business Council Member. She coaches overwhelmed millennials on how to accelerate paying off debt and be financially independent. Some of her financial accomplishments include paying off $30,000 in 10 months, buying her first home at 19, and paying $472 for her master's degree.What You'll LearnHow Whitney got started on her journey of rocking her personal finances (and at such a young age)How she managed to purchase a home at 19 years oldSome of the challenges that come with working to meet big financial goals.How she dealt with socializing while reducing her spending (i.e. dining out less often)Why she believes making some short term sacrifices is definitely worth itwhy she loves shifting what we think financially responsible people look likeHer recommended first step towards changing your financial landscapeResourcesThe Money Nerds PodcastReal TalkThis episode's Real Talk stories are about 1) #FinancialPositivity and 2) navigating Oslo, Norway. If you want to have your story featured on a future episode, download the Nav.it app and leave your post in the Community section. We'd love to hear from you! If you are enjoying the Nav.it podcast. please take a moment to rate, review and subscribe – we would appreciate it as it really helps us grow the show. Other comments, suggestions or other feedback? Find us on Facebook, Instagram and Twitter at @letsnavit. Co-Host Erin Papworth turns the tables on Host Lisette Austin (a.k.a Jet Set Lisette) interviewing her about her experiences nav.ing travel reward credit card systems, resulting in saving over $100K in travel costs. Lisette shares about what travel hacking is, how she's managed to maximize credit card sign up bonuses without damaging her credit score or going into debt, and offers tips to those who want to get started doing the same.What You'll Learn- What travel hacking is- How she started using credit card sign up bonuses as a way to travel- Why being willing to look at her finances was the real key to travel hacking- Why her credit score is still in the 800s despite opening a multitude of cards- Dispelling other myths around travel hacking- Why staying organized is important (and why the effort is worth it)- Her favorite spontaneous trip using miles- A travel fail story. :)- Tips for getting started with travel hacking BONUS: Nav.igators get 10% off Jet Set Lisette's online travel hacking course by using this discount link! jetsetlisette.com/nav.itThis episode's Real Talk story is a fabulous story about one woman's challenges while navigating Hong Kong (complete with surprise ending). If you want to have your story featured on a future episode, download the Nav.it app and leave your post in the Community section. We'd love to hear from you! If you are enjoying the Nav.it podcast. please take a moment to rate, review and subscribe – we would appreciate it as it really helps us grow the show. Other comments, suggestions or other feedback? Find us on Facebook, Instagram and Twitter at @letsnavit. In this episode Nav.it CEO and Founder Erin Papworth talks about why she believes true wealth is experiential. Join us for a conversation about why it's time for women to redefine wealth, how learning to nav your finances brings more freedom, and the benefits of increased access to financial systems.What You'll LearnMore about the changing definition of wealthThat we are the sum of our experiences and relationships, not our bank accountsHow money is a tool to fuel our lifestyles, or a result of us pursuing what fulfills us Travel as one example of the pursuit of unique experiencesThe importance of confidence, resilience and grit in nav.ing your way to your true wealthThe history of women (and other marginalized people) and wealth in our countryThe benefits of increased access to finance management systems How understanding those systems can help you build wealth, even with a modest incomeFor this episode's Real Talk story, Erin shares about how she nav.ed some challenging experiences in Scotland. If you want to have your story featured on a future episode, download the Nav.it app and leave your post in the Community section. We'd love to hear from you! If you are enjoying the Nav.it podcast. please take a moment to rate, review and subscribe – we would appreciate it as it really helps us grow the show. Other comments, suggestions or other feedback? Find us on Facebook, Instagram and Twitter at @letsnavit. In episode 2 Nav.it host Lisette Austin talks with Jamila Souffrant, a Certified Financial Education Instructor (CFEI), podcaster, writer and founder of JourneytoLaunch.com. Jamila is considered a go-to financial thought leader in the personal finance field and is the resident financial expert on a weekly segment on News12, the most watched local TV news-station in NYC and has been featured in other notable media outlets such as ESSENCE, Refinery 29, Money Magazine, CNBC, CBS, Business Insider and more. The Journey To Launch Podcast was also named one of "27 Podcasts You Need To Start Listening To In 2018 by BuzzFeed". Jamila and her husband saved $169,000 in two years and are debt free besides their mortgage – all while living in NYC with three small children. She shares her incredible financial journey and tips on how to nav your finances and grow true wealth.What You'll LearnWhat propelled Jamila to start on her journey to financial independenceHow she and her husband were able to save $169K in 2 years What some of the changes they made looked likeThe power of simply being aware of what you are spendingHow Jamila's mom influenced her life and set her on the path she's on todayWhat the F.I.R.E. movement isHow her journey to financial freedom has changed her lifeHow wealth is equally defined by having flexibility, and increased time for family and experiencesWhat some of the challenges and lessons have been along the wayHer tips and advice for others starting on the path to a new financial realityResourcesJourney to Launch.comJourney to Launch PodcastThe episode ends with a Real Talk story about visiting Philadelphia. If you want to have your story featured on a future episode, download the Nav.it app and leave your post in the Community section. If you are enjoying the Nav.it podcast. please take a moment to rate, review and subscribe – we would appreciate it as it really helps us grow the show. Other comments, suggestions or other feedback? Find us on Facebook, Instagram and Twitter at @letsnavit. In this kick off episode, learn why Nav.it CEO and Founder Erin Papworth dropped everything to create a female-forward money management app that provides practical finance, travel and life tips. Erin spent 12 years working in sub-Saharan Africa on projects that increased health care access for marginalized women. Her work and travels have taken her to Tanzania, Zanzibar, Kenya, Malawi, and Haiti, Cameroon, Sudan, Mozambique, and other countries in Africa and around the world. Upon her return to the U.S., Erin became determined to change female conversations around finances and help women redefine their lifestyles and what wealth means to them. Erin shares about her entrepreneur journey and her drive to help women navigate finances, travel and life.What You'll Learn The backstory behind the genesis of Nav.it The history of women and access to wealth The core underpinnings of the Nav.it philosophy The importance of women learning to navigate traditionally male dominated systems Information about the Nav.it app and what it providesWhat some of the challenges have been along the wayThe episode ends with a Real Talk story about Singapore from the community section of the Nav.it app.Resources Nav.itShoe Dog: A Memoir by the Creator of Nike If you want to have your Real Talk story featured on a future episode, download the Nav.it app and leave your post in the Community section. If you are enjoying the Nav.it podcast. please take a moment to rate, review and subscribe – we would appreciate it as it really helps us grow the show. Other comments, suggestions or other feedback? Find us on Facebook, Instagram and Twitter at @letsnavit. Welcome to the Nav.it podcast! 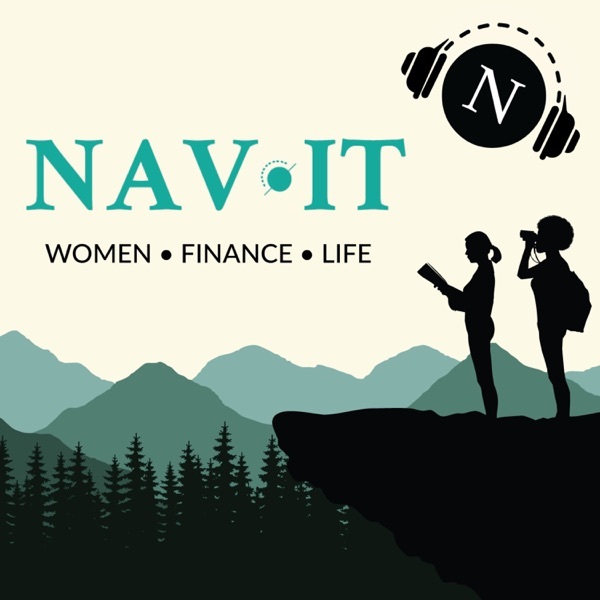 This podcast is dedicated to inspiring you to become prosperous on your own terms, elevating the way you experience the world.At Nav.it we believe women are redefining what wealth means to them. We invite you to join the conversation as we build a feminine vocabulary around money and what it means to be successful. Hearing how other women have rocked their lifestyles, finances, and travel—and have navigated traditionally male dominated systems, is a great way to get inspired and shift mindsets . This podcast provides tips, resources and insights through weekly discussions and guest interviews with featured Nav.igators. What is Nav.it?Women finally have access to their own money, and it’s time we start talking about it, managing it and owning it. Nav.it is three things:1) A money management app that provides practical finance life and travel tips - all speaking to the feminine experience. You can use the app to set up tangible savings priorities to achieve lifestyle goals. ( Download it at http://nav.it and get a 30-day free premium trial).2) A verb: To "nav.it" means to navigate successfully through challenges and obstacles to get to your end goal.3) A community: a sisterhood of navi.gators who will support you on your journey to financial and experiential wealth.Let's Nav.it!